So the hardlistening staff caught this piece on Weekend All Things Considered the other day. How Much Are Colin Kaepernick’s Political Views Impacting His Unsigned Status? We’re going to take a few minutes now to talk about sports. Now, even if you’re completely consumed by March Madness, you’re probably keeping an eye on the NFL draft and free agency shuffle. So we thought we’d check in on what’s happening with former San Francisco 49ers quarterback Colin Kaepernick. You might remember he got a lot of attention last year for choosing to kneel during the national anthem as a protest against police violence. Now he is a free agent and has not yet found a team. Now some critics like President Trump think those are his just desserts. For the next five minutes ATC host Michel Martin and NFL commentator Bucky Brooks talked about Kaepernick’s struggle to find a new team. But never once did they mention that it’s a self-inflicted wound. Yesterday’s New York Times piece by Victor Mather also avoided the real issue. Mark Sanchez found a job. Mike Glennon found a job. So did Josh McCown and E. J. Manuel. But Colin Kaepernick, who led the 49ers to the Super Bowl just four years ago, remains unemployed. Is Kaepernick not qualified to play quarterback in the N.F.L. anymore? Or is it something else? Some skeptical fans are wondering if the quarterbacks who have landed jobs with teams have one significant asset that Kaepernick does not have: They all stood for the national anthem last season. Actually, it’s not Kaepernick’s arm or his knee that’s created this problem. It’s his brains – or lack thereof. Buried in the Times piece you’ll find the real reason Kaepernick is teamless. 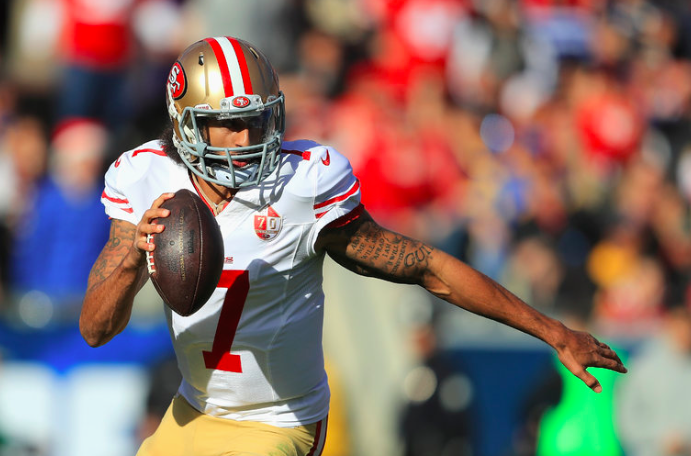 In the off-season, Kaepernick opted out of his contract, hoping for a better situation. So far, that situation has not arrived. Cost to Kaepernick: $14.5 million. In 2016, Kaepernick restructured the deal the 49ers gave him when they were convinced he was the franchise quarterback. He gave up $14.5 million in injury guarantees for the ability to opt out of his deal at the end of the year. So let’s not shed any tears for Colin Kaepernick. He’s a victim entirely of himself. This entry was posted in Uncategorized and tagged blacklist, Bucky Brooks, Colin Kaepernick, Michel Martin, New York Times, NFL, NPR, San Francisco 49ers, SB nation, Victor Mather, Weekend All Things Considered. Bookmark the permalink. I don’t follow your logic. Why he is a free agent isn’t the issue. The question is whether it’s his ability (or lack of ability) or his political views which are standing in the way of a big contract. I take your point, Robert, but what I’m saying is that a reasonable person in that situation might think a) I’m regarded at this point as a marginally talented quarterback, and b) I’ve made myself kind of toxic with all that taking the knee stuff, so c) maybe I should hang onto the megabucks deal I already have.